1. AATG membership requirements: All teachers regardless of AATG membership may participate in the National Exam. However, only current AATG teacher members in Maryland and DC schools and their students will be invited to participate in the Chapter Awards Ceremony. (Northern Virginia schools are part of the Virginia Chapter for National Exam purposes.) This Ceremony is organized by the volunteer members of the AATG Board and is partially funded through AATG membership dues. 2. Test Levels: Students must take the level test of the course they are currently enrolled in, or, if not currently enrolled in German, the last course taken. Students may only retake a level test if they are re-taking the course. The Chapter Awards Ceremony honors students who have placed in the 85th percentile or above. Students may only receive a monetary award once for the same level test. 3. Grades for Awards Ceremony: Students in the 9th – 12th grades who are enrolled in a German foreign language course either at their school, or home-school program or at a language school are eligible to participate in the Chapter Awards Ceremony. Students in lower grades should be honored within their school programs. 4. Heritage Speakers: Students who have acquired the majority of their German language ability outside of the classroom (either because of a German-speaking home environment or a substantial stay in a German-speaking environment) are eligible to take the National Exam but are required to check off the appropriate box to ensure that their scores are not computed with purely classroom learners. This allows for the fair scoring and calculation of percentiles of classroom learners of German as well as accurate percentiles for heritage speakers. Teachers are expected to adhere to this guideline when advising students. 5. Teachers are expected to adhere to these guidelines. A teacher who is found to be unreliable may be barred from future participation in the Chapter Awards Ceremony. 2014 marked the launch of the new format for the National German Exam. Despite some initial technical issues, which have been addressed, the new format was welcomed by nearly all. Perhaps you are asking yourself how such an exam is created. Here is a behind the scenes look related to the writing of the 2015 exam. In January of 2014 various teachers received an invitation from Wiebke Strehl, NGE Chairperson, to be part of the writing team. Those who agreed received an assignment to be completed at home and submitted by a certain due date. My personal assignment was a total of sixteen authentic items from Levels 1-4 in specified areas of graphics, shorter and longer readings, audio and video samples. Along with my items, I created questions to accompany each submission, as did each person on the team for his/her submissions. 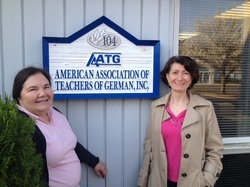 The writing team met at AATG offices for a weekend in April. The group consisted of high school and college professionals from around the country; some I had known and some were new to me. Some names certainly familiar to all of you are: Deborah Mifflin (Johns Hopkins University and our AATG Regional Representative), Hal Boland( AATG Vice President from Virginia), and Keith Cothrun (AATG Executive Director). After the initial overview, we divided into smaller teams. My team focused solely on graphics and reading passages for Levels 2, 3, and 4; we looked at all the items everyone had submitted in these areas and selected those we deemed best. The team then looked at the questions that had been submitted; we used some as submitted, edited others, and also added some created by the team. Additionally we coded each question according to the type of question; for example, PV stood for point of view. Before going our separate ways, we met again as an entire group to review what each group had done. Wiebke verified that she had all the submissions and gave us further instructions. In the coming weeks we would be receiving the exams to review for final edit. Hard work? Absolutely, but also incredibly fun and rewarding. The camaraderie of the group was amazing. Evenings were collegial and filled with laughter. I am so looking forward to next year.